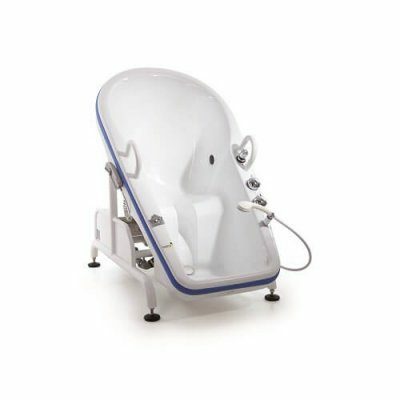 The free standing Motion height adjustable and reclining bath is the new fresh approach to stylish and comfortable bathing offering a safe experience for the client whilst also understanding the needs of the care giver. The Astor-Bannerman specialist design team have worked very closely with professionals in the care and therapy sector for many years, which has enabled us to combine a contemporary appearance with practical performance keeping the needs of the client and care giver paramount. 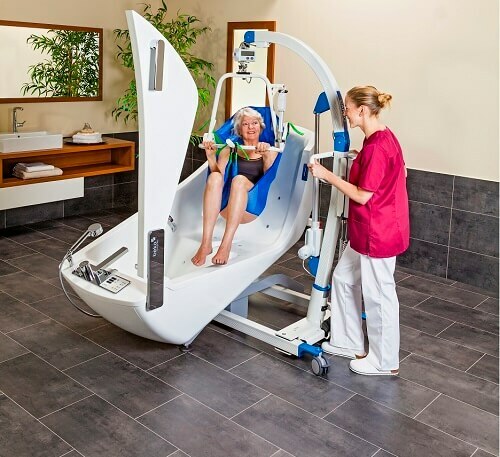 Only one carer is needed to operate the Motion reclining bath and safely control the functions which have been incorporated into this assisted bath. 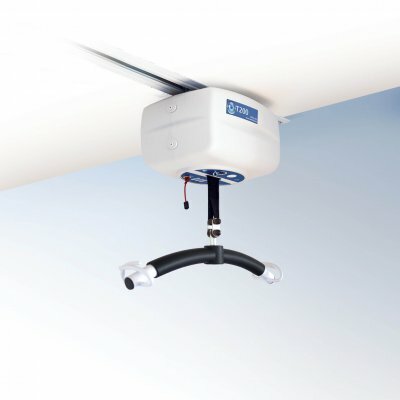 The carer can easily open/close the door, adjust the height of the bath and perform the reclining motion for easy access and positioning making it simple to operate. 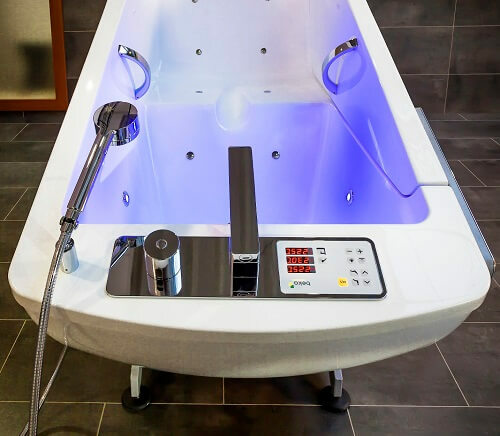 The large foot well area can be pre filled with 98 litres of water so the bather is comfortably immersed in water when the bath is reclined into a horizontal position. 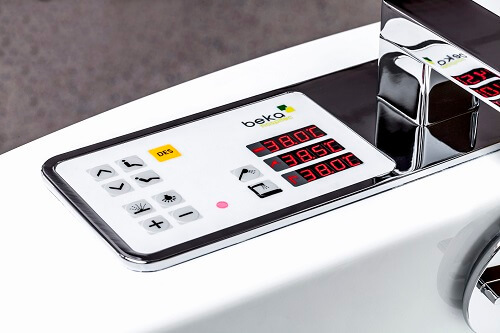 In addition, the bath fills at approximately 66 litres per minute and drains at 75 litres per minutes, making the Motion bath perfect for saving time without compromising on care and comfort. 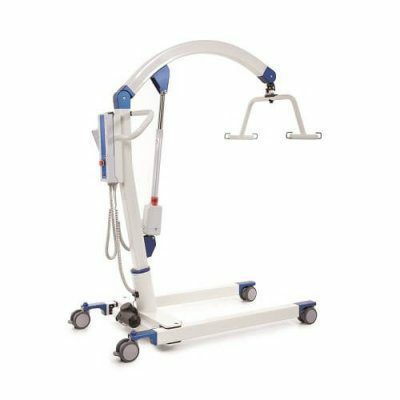 The Motion bath boasts a spacious and ergonomic design with flat, smooth door opening with low entry height, and is compatible with any stand aid, floor hoist or ceiling hoist as well as self-transfer for more mobile clients. 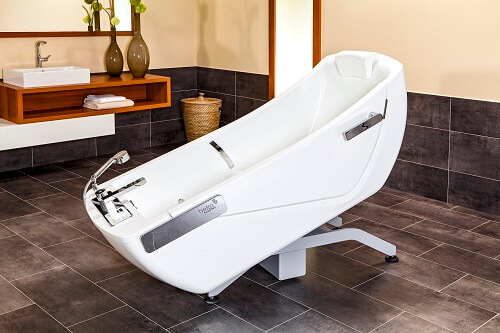 The external dimensions of the Astor-Bannerman Motion bath are much smaller than similar care baths on the market saving up to 500mm in floor space without reducing the internal dimensions for the bather. 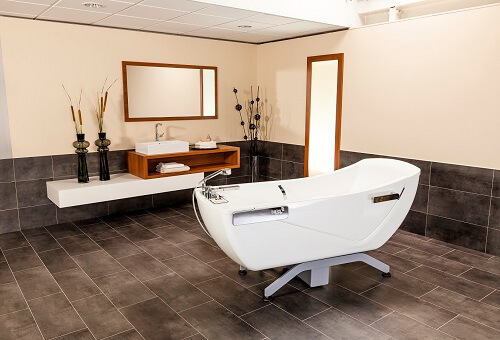 The Motion bath is free standing so can be positioned anywhere in the room to change the view if desired and is exceptionally comfortable and supportive and the easy to clean edges and seat opening ensure the ultimate in hygiene control. 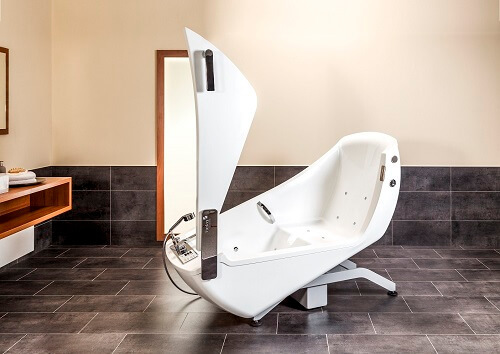 As with all Astor-Bannerman specialist baths, the Motion is available with a range of optional extras including soothing chromo therapy colour changing LED light system, massaging warm air spa (with or without an additional aromatherapy system) and integrated Bluetooth speaker system to help stimulate the senses. 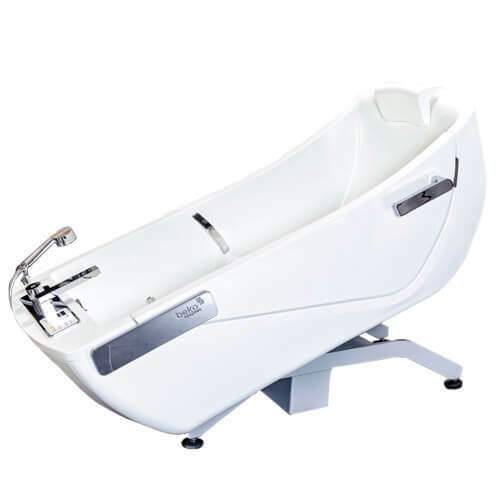 As with the Avero baths by Astor-Bannerman, the Motion is also available in almost any colour to suit settings and care needs.